The Ministry of Transport, Communications and High Technologies of Azerbaijan offered the member countries of the Cooperation Council of Turkic Speaking States (Turkic Council) to sign a multilateral agreement on the implementation of measures for mutual recognition of electronic signatures, said the ministry in a message Nov. 10. Azerbaijani Minister of Transport, Communications and High Technologies Ramin Guluzade made such an initiative during the second meeting of ICT ministers of the Turkic Council member countries, held recently in Istanbul. The minister noted the importance of carrying out joint work on the recognition of e-signature between the member countries of the organization, which is important for the development of turnover in e-commerce, and suggested as a first step to sign a multilateral agreement. Guluzade also spoke about holding the next high-level meeting on the construction of the TASIM cable line during the upcoming 23rd Azerbaijan International Telecommunications and Information Technologies Exhibition and Conference (Bakutel) on December 5, 2017. 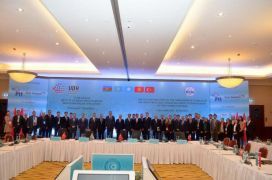 He highly appreciated the cooperation of the Turkic Council member countries towards the implementation of this project which, according to him, is of strategic importance, for the countries of the region, and is an important component for eliminating digital inequalities in landlocked countries. The TASIM construction project envisages the creation of a major transit link from Frankfurt to Hong Kong. Russia (Rostelecom), Kazakhstan (KazTransCom), Turkey (TurkTelecom) and China (China Telecom) are also involved in the TASIM project. Azerbaijan is represented in the project by AzInTelecom LLC.